Some businesses are so focused on establishing a Facebook presence that they underestimate all the other opportunities for social media integration. If you are an email marketer, Twitter is one you may not want to overlook. Twitter is similar to email in a way. Your followers are like your subscribers and if you blow it, you’ll lose them and may even be called a spammer. With email marketing, you build a list. With Twitter, you build a network of followers. You are ultimately striving for the same goal so get out there and start trying to make connections on this new platform. Growing your followers isn’t necessarily a difficult chore, but finding those that are relevant to the cause are what you need to be focused on. You want to connect with the people who are more likely to respond and spread your message to others, the people who would also be perfect for your email list. Make sure your integrated strategy is a targeted one. You can actually start connecting your followers to your email marketing as you build your Twitter presence. Once you meet a few people, you can give them a sample of what you have in store outside of the network and even invite them to join your email list. The great thing about this is that it works both ways. For example, you could easily send out a call to action for your email subscribers to connect with you and join the conversation on Twitter. Let the complete newcomers know how everything works and how they can help spread the word through the network. This is something your less savvy subscribers will appreciate. When you think about it, Twitter is the ideal tool for spreading your message. It’s brief, targeted and extremely cost effective. You’d be surprised how far a short tweet with a link to your newsletter or signup form can travel. However, even though it is a different channel, many of the rules remain the same. 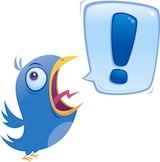 In order to have any sort of impact with Twitter, you need to make sure your communications are relevant all the time. Give your followers a reason to keep listening - with all the noise on Twitter, it's easy for users to be distracted. Several marketers would like to know how often they should use Twitter for business purposes. The best answer is that all depends. A company using the site to provide another outlet for customer service would obviously need to be more devoted than one trying to promote a monthly newsletter. The most important thing is staying consistent. If you can only afford to publish one tweet per week, make sure it’s the best tweet you can possibly come up with. You can start your own promotion for special events with a Benchmark Twitter email template.